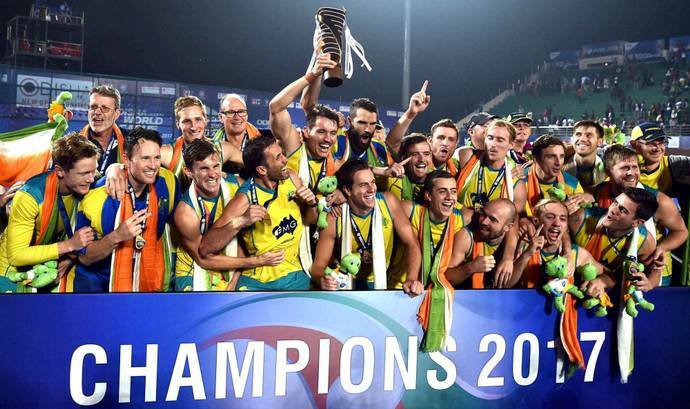 Bhubaneswar, Dec 10: Drag-flicker Blake Govers struck two minutes from time as defending champions Australia edged past Argentina 2-1 to win the title in the Hockey World League (HWL) Final at the Kalinga Stadium here on Sunday. Govers struck to the left of Argentine goalkeeper Juan Vivaldi in the 58th minute after Australia saw Jeremy Hayward's penalty corner conversion in the 17th minute being equalised within a minute by Agustin Bugallo. It was a fitting final given that the contest was between Olympic champions Argentina and the world champions. The match lived up to the expectations, with both teams showing their attacking game. While Australia kept their game of all-round attack, Argentina did their best to maintain their game of holding the ball in their half and wait for a counter-attack. Even though Australia pressed hard, Argentina kept moving the ball quickly. Australia drew the first blood, with Hayward flicking between Vivaldi's left leg and left-bar defender Ignacio Ortiz. However, the South Americans pulled level within a minute as Bugallo deflected home at the right near post a right cross from Juan Gilardi. Afterward, both teams were locked in a tight battle. Argentina matched Australia's physical game head-on. Eddie Ockenden came closest to give Australia the lead a few seconds prior to the close of the third quarter. Central defender Mark Knowles' long-range ball was met by Blake Govers just outside the circle and he fed the veteran attacking midfielder on the left but the latter was denied by the cross-bar. Juan Lopez responded for Argentina following a superb counter-attack but with only goalkeeper Tyler Lovell to beat, the attacker drove wide of the left post. Just when it seemed the match will go to the penalty shootout, Australia earned a penalty corner from which Govers made no mistake to make it 2-1. In the dying seconds, Diego Paz failed to connect a flick from the left as Australia survived some anxious moments to earn the 2-1 win and retain the title they had won in Raipur two years ago. "We controlled the game well and got some clear-cut chances but didn't make the most of them," Man-of-the-Match Gilardi of Argentina said after the match.